President Trump has said that family separation deterred Central American migrant families from crossing the border illegally. Now that separations are over, more families are coming. McALLEN — Nelson Enrique Sánchez said he got the call in September: Come now, his mother-in-law said, and bring the boy with you. So Sánchez did as he was told. Led by smugglers, he and his 10-year-old son, Michael, traveled north from Honduras to join her in Louisiana — first by car, then on foot, then on a raft across the Rio Grande, before they surrendered to Border Patrol agents. If they had arrived a few months earlier, they likely would have been split up, the boy sent to a shelter or foster care and his father kept in detention — the result of a “zero tolerance” policy meant to deter immigrants from crossing the border illegally. That policy saw the government separate thousands of families as it prosecuted adults who crossed the border illegally while following a court agreement that says children cannot be detained for longer than 20 days. But after public outcry led President Donald Trump to end that policy in June, parents with children have been crossing the border in record numbers. In September, Border Patrol agents arrested 16,658 family members along the U.S.-Mexico border, up 80 percent from July and more than any other month on record, according to data released Tuesday. Most of those families, like Nelson and Michael Sánchez, were released from detention within days — a return to the so-called "catch and release" practice that Trump has criticized. So they came here, to a respite center run by the Catholic Church in McAllen, eating hamburgers and watermelon and glancing at multi-color, laminated maps of this unfamiliar country whose leaders are now considering a new crackdown on illegal border crossers that could include resuming family separations. “If they feel there will be separation, they don’t come,” Trump told reporters on Saturday. 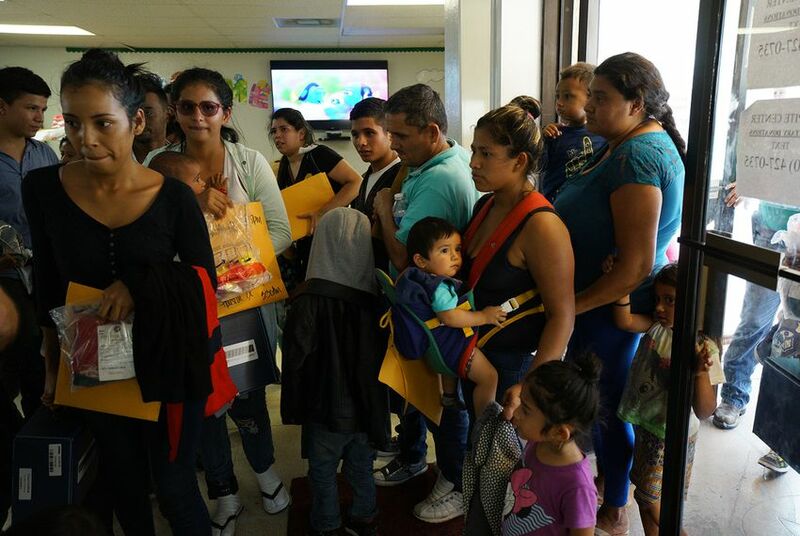 That day, the line at the center — where families come for a meal, a shower and a change of clothes after being released from detention — snaked out the door. About 300 people were crammed inside, nearly all of them parents with children. Some said they had never heard of Donald Trump, much less anything about zero tolerance. Others said they decided to make the journey now because they knew they would make it out of detention easily with children in tow. And for Nelson Sánchez, it was an opportunity to escape mounting poverty and insecurity at home. Unlike many of the other migrants at the Catholic Charities respite center, Nelson said he was not the target of violence. But he hadn’t been able to find any work as a day laborer in months. Even if he did, the most he could earn in a day was 300 lempiras, or about $12.50. The offer from his mother-in-law was the chance to change that, he said. While the overall number of migrants arriving at the border is not at a historic high, the demographic profile of those coming has shifted noticeably in recent years, from single adults to families with children. In the past year alone, the percentage of children and families has more than doubled: Just over 40 percent of all migrants apprehended in September were children traveling alone or with family members, up from about 18 percent in September of last year. Officials in Washington, from Secretary of State Mike Pompeo to the president, have pointed to these numbers as evidence of a crisis at the border and argued that the return of catch and release has encouraged migrants to come with their children. But recent migrants’ reasons for leaving Central America have more to do with conditions at home than any particular U.S. policy, said Cris Ramón, an immigration analyst at the Bipartisan Policy Center, a Washington, D.C., think tank. Back in the McAllen respite center, Ever Murcia, who left Honduras for Kansas with his 17-year-old son, José Aníbal, said he had heard regular updates about the zero-tolerance policy earlier this year through social media like Facebook and WhatsApp and on television news. “But I had seen lots of people keep coming over here, no matter what,” he said. Murcia said he had long thought about leaving his job growing corn and beans for more profitable work in the U.S. He said he left when he had saved up enough money for the trip. Dora Alonzo Quijivix, a community leader in Guatemala’s western highlands, said news of zero tolerance did not necessarily reach areas like hers, where access to media is limited and many speak only indigenous languages. But lately, some smugglers have recently resumed making trips to the U.S. after stopping during the height of zero tolerance. The smugglers have even advertised on local radio stations, telling listeners that now is the time to make the journey north, Quijivix said. Editor's note: The Texas Tribune and TIME have partnered to closely track the family separation crisis at the U.S.-Mexico border. This story is not available for republishing by a national news organization until Oct. 25 at 3 p.m. Texas news organizations may run it at any time. For more information email nchoate@texastribune.org.